During a service, there are two options for the mainspring. You can either reuse the old one (after you’ve cleaned and lubricated it) or replace it with a new one. So, a mainspring doesn’t have to be replaced with every service. If it’s still in good condition, especially in more modern watches, it’s perfectly fine to reuse it. However, if you’re dealing with a vintage watch, I recommend replacing it with a new mainspring. Even if it still looks to be in good condition. You never know how long the mainspring has been inside the watch and micro fractures are nearly impossible to spot. A mainspring is one of the cheaper parts, and this is the perfect opportunity to replace it. It’s cheaper than reusing the old mainspring and having to replace it one year later because it broke after all. So, let’s say you decided to replace it. 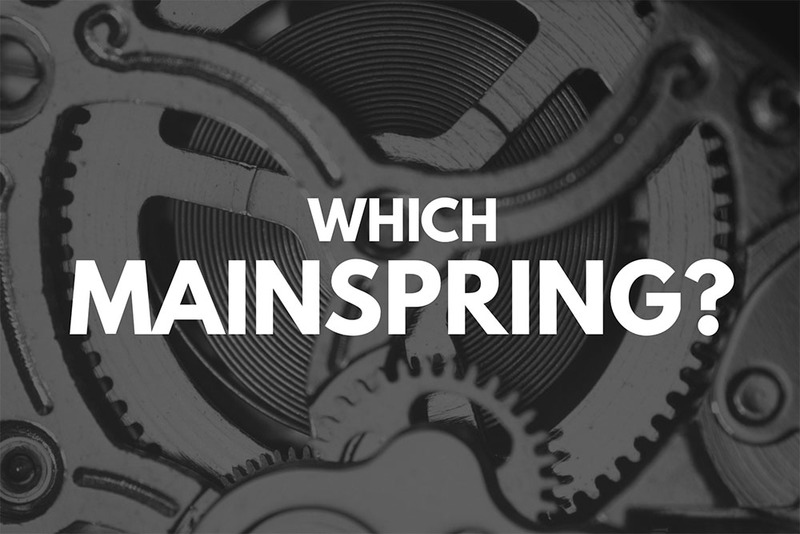 How do you choose the right mainspring? The measurements you need are the height, the thickness, the length, and the inside diameter of the barrel. Make sure to use a digital caliper because the measurements need to be precise. Don’t forget to add a bit to the length if a piece is broken off. After you’ve written down the dimensions, you can use them to search for the correct mainspring online. There’s one problem with this method though. How do you know if the previous watchmaker fitted the right mainspring? Perhaps he or she installed the wrong one. That’s like copying in class from the one guy who didn’t study. Mainspring should only occupy ½ of the barrel. Square the radius of the inside of the barrel and multiply by Pi (3.1416). Square the radius of the barrel arbor hub and multiply by Pi (3.1416). Subtract the area of the arbor hub from the area of the barrel. Divide the outcome by 2 because the mainspring only occupies ½ of the barrel. Divide this mainspring space by the thickness of the mainspring. Length of the mainspring when the inside diameter of the barrel is 9 mm, the diameter of the barrel hub is 3 mm, and the thickness of the mainspring is 0.11 mm. 3 ÷ 2 = 1.5 (radius of the barrel hub). 4.5² x 3.1416 = 63.62 (area of the barrel). 1.5² x 3.1416 = 7.07 (area of the arbor hub). 63.62 – 7.07 = 56.55. 56.55 ÷ 2 = 28.28 (mainspring area). There are a few catalogs that you can use to look up the correct mainspring. One of them is Bestfit. You can look up the mainspring info in the MSPG. DENNISON column and use the conversion table in the back to convert it to metric. Bestfit describes itself as a Watch Material Encyclopedia of Watch Parts. You can use this book to identify movements and to look up info such as the hole diameters of the hands and, you guessed it, the dimensions of the mainspring. One downside is that it doesn’t merely list the metric measurements. You can look up the width and strength in Dennison and the length in inches. Then you’ll have to use a conversion chart in the back to convert it to metric. You might have noticed that Bestfit also doesn’t list the diameter of the barrel. You’ll have to measure it yourself with a digital caliper. Générale Ressorts (GR) is another one. It’s a company of the ACROTEC Group (KIF Parechoc is also part of this group) and mainly produces barrels and mainsprings. The GR catalog lists the calibre, the GR code, the height, the strength, the length, and the inner diameter of the barrel. GR has a massive catalog that you can use to look up the mainspring for the caliber you’re working on, but it seems that the hard copy is obsolete. You can still download the catalog and the comparative table as separate PDF files though. You can find them on the Cousins website, for example, but you’ll need to create an account to download documents. As there were a couple of companies that produced mainsprings, I’m sure there are other catalogs out there. One example is a little booklet I have from Robert Pringle & Sons, a jeweler in London, with charts for Nivaflex mainsprings. This booklet has two sections. One section lists the mainspring ref no. of several calibres from various watchmakers. Here you see the part that shows the metric measurements of all the ref nos. There are some websites to help you with mainspring dimensions. One of those is Ranfft. It’s mostly used to identify movements, but it also lists some additional info including mainspring dimensions. Please be aware that although it offers this info, it’s not a platform that concentrates on watchmaking. A couple of times, I noticed that the info on Ranfft was different to that from other sources. I’d always trust the watchmaking-related source in that case. Cousins lists the mainspring with the right dimensions if you search on Watch Parts Branded and select the calibre number you’re working on. If it doesn’t show the mainspring or if it’s obsolete, the website also allows you to search on measurements. As mentioned before, the Générale Ressorts catalog is the largest source of mainspring info out there. The guys at Watch Guy did an excellent job of scanning as many GR charts as possible to collect all the data in a single file on their website. Cheers! Make sure you order a mainspring with the right attachment. You wouldn’t be the first person (or the last) who orders an automatic mainspring for a manual winding watch. Some older watches require a mainspring with a special bridle such as a T-end or an end with a hole. How do you choose the right mainspring? Let me know in the comments below.